Animated: No; Low-poly: Yes; Materials: Yes; Rigged: No; Textured: Yes; UV Layout: Yes; 3D File Formats Included: .3ds (multi format), .fbx (multi format), .max (3ds Max), .obj (multi format); Created In: 3ds max 2017; Geometry: Polygons; Poly Count: 8000. This File contains 15 Low Poly Plant Models created in 3ds Max. The Pack counts with 3 different Cactus, 2 Pinetrees, 5 Oaks, 2 Palms and 3 Grass models. All of them are modeled as Low Poly in order to could be included in Games or Apps easily. It includes the next formats: .max (2014) .obj .mtl .fbx .stl (3D printable) & C4D compatible. The Pivots are located in the lowest part of the plants to make easy and fast the implantation in the file through "Object Painting". The Scene counts with Lights, Materials, Textures and Renders Setups. Earth 3D; Copper Material; Grass Material; Mannequin 3D; Broomfield Lamp by Ralph Lauren; Eames Plastic Chairs DSW DSX DSR DSS; Vintage Tolix Chair 3D. 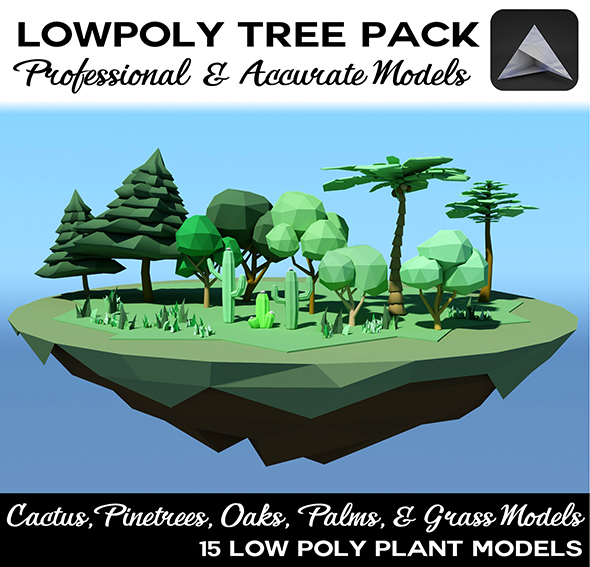 Keywords: 3dmodels, 3ds tree, app trees, cactus, forest, game development, gamedev, gameready, grass, land, low poly, low poly tree pack, low poly trees, lowpoly, lowpoly cactus, lowpoly grass, lowpoly oak, lowpoly palm, lowpoly pinetree, lowpoly tree, nature, oaks, palms, pinetree, stl printable trees, tree pack, trees, trees pack, vegetation. Best stock graphics, design templates, vectors, PhotoShop templates, textures & 3D models from creative professional designers. Create 3DOcean 15 Low Poly Trees Pack 20830347 style with PhotoShop, Illustrator, InDesign, 3DS Max, Maya or Cinema 4D. Full details of 3DOcean 15 Low Poly Trees Pack 20830347 for digital design and education. 3DOcean 15 Low Poly Trees Pack 20830347 desigen style information or anything related.